Naan Kadavul - my view. I have nothing much to write about the movie Naan Kadavul – the name portraits the picture, but there is no more reasonable thoughts there to declare someone as god. Keeping away my unbelief, the title has nothing to do with my interest on catching this movie, thus I believe in director Bala’s very unusual plot and showcasing an ever seen cinema. Going on up and down review about this movie, I went on my risk to watch the movie that could not satisfy my intension. But somehow it hurts and felt exotic, which we ever imagined or not. It’s all about an Aghori (ascetic) and oppressed disabled beggars, whom were involuntarily under a dominate underworld don. Those are beggars, uncommon that we meet at our street corners and traffic signals, but what we seen at the movie is crush, whether its certain or imagination is all up to director’s suspect. Rudran, the main character rules up to expectation is lose in my views; no matter how hard work Arya done to observe the character, which I felt unconnected with others. I think the director must have something in mind, which I can’t understand or I don’t know. The movie is so realistic, where no computer graphics or backup is used. The characters have the distress in eyes and actions with much physical efforts. The abnormal position of arya is stunning, which is an adventure already through media; and except few differences most of his life process has been left blank is great disappoint. 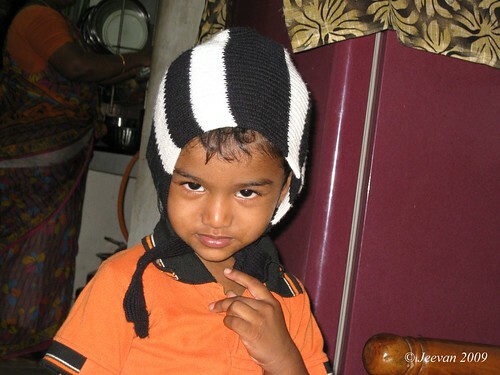 The mother sentiment doesn’t workout here, and no more his expressions is shared with others. The odd disabled people and children got me disbelief. It’s much hater what’s happening under the ground and close up shots which fail to create sympathy, trembles at such deformity and cruelty happen around. But it was very different underworld someone has to imagine with reality, apart it disclose misshapes and unpleasant way of people sharing our world. Heroines get a chance to showcase there talent rarely in Tamil cinema, where Pooja got to perform excellent as a blind! More than any other characters, she impressed me. The boy who overcomes the target, laughs, and makes us laugh with his thought tempting jokes apart kick fake divines. The busy life at Kasi bank and burning of masses showcases an idea about this place; and the reflection at Ganges of sun dawn and conclude is captured well in advance. It wonders why does director took this much time of 3 years to completer the movie, which could not run more than 2 hours. I feel the movie set into brief loses its head and tail, without a beginning or end, it concludes with lack of expectation. My advice is if you’re a fan of unusual cinema and been a brave heart, go and watch at your courage. let birds and indigenous lullaby. 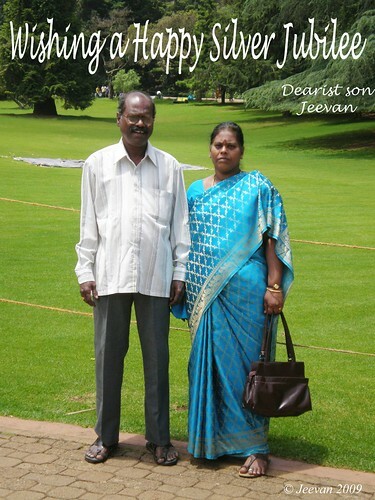 This is a tamil song I fell in love recently from the time I began to listen. It was something like listing to a familiar country love song after sometime, similar it sounds like aiyaiyo… from movie paruthi veeran, but it strikes fresh. 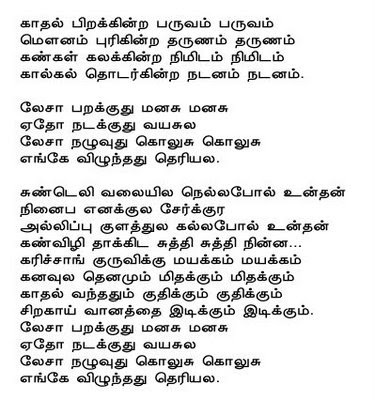 i tried to write the song’s early part of the lyrics – in Tamil as well English, thus it follows. to wing dash the horizon. and gentle sunshine at my gateway . and the inspiration behind my interests. 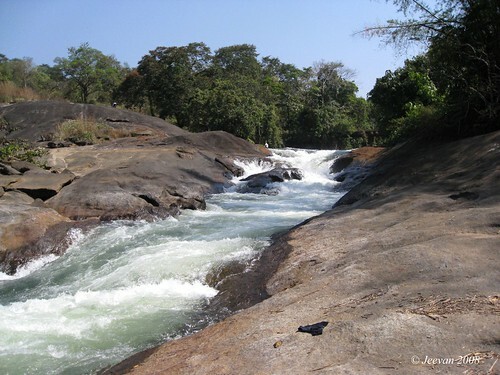 More than the Rainforest, there was much we covered on the first day in Valparai, visiting Athirapally Falls in Kerala. We plan to begin early our travel, as we need to cover much distance across dense forest, but somehow we managed to leave home by 9 and reached Sholayar dam by 10. 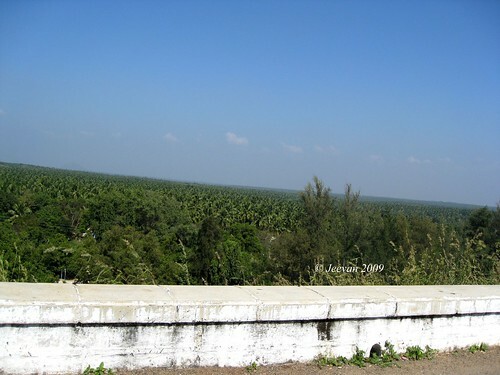 We could see the backwaters of Sholayar reservoir about 9km on the way before the dam. That was a pleasant view of the reservoir water in sky blue color and clumps of tea gardens around. We moved after taking some pictures and because of some restore working going on, the permission was denied to enter the dam. Then after breakfast in a small restaurant near sholayar, we proceed… What’s special about the Sholayar dam is ‘it’s a second highest dam in Asia constructed by rocks’. 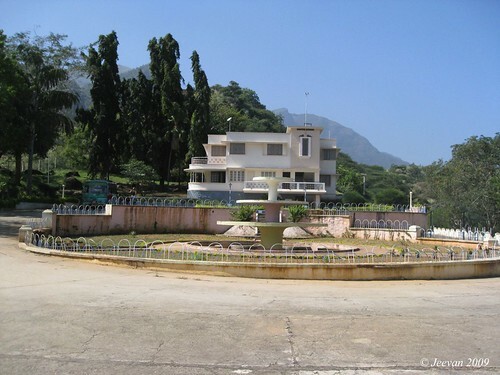 This is one important place in valparai to attract tourist. 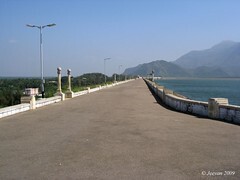 On the way some 30km away we found a scenic place called Sholayar dam-2. In the middle of thick forest of bushes lies this undisturbed blue pool! This space is completely haven of nature which needs to be protected from humans claim and one of my favorite sites is this, what I wish to survey again. 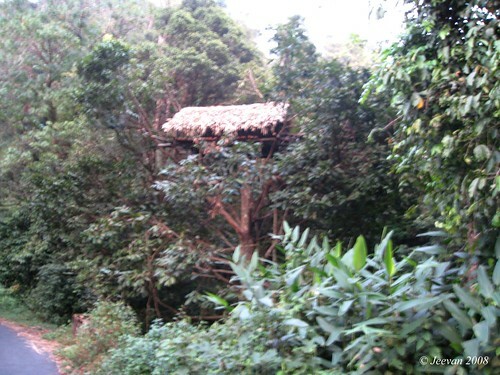 As it was in the mid-rainforest, seems never get dry and receives water from Sholayar-1. 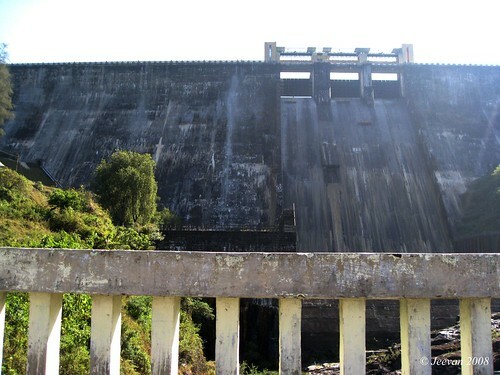 The water from this dam passes through three large pipers and not clearly, after used for hydropower, the water is drive into a channel which persuade into small falls and lake on the way later to flow from an height of 80ft as Athirapally falls to merge with Chalakkudy river. A small falls I mean is something more delight than the huge Athirapally, which is crowded and unfit to enjoy the water than just viewing the stunning waterfalls. We stopped at somewhere in between before to Athirapally, to find a large stream and falls where my bro and uncle went to bath, which was occupied by some guys and with there support they stepped into the forced water. They never have a mind to leave the place and unless we forced to bring them out of water. I haven’t expected the Athirapally Fall to be such crowded tourist place. This is a place renowned as shooting spot and it is also called as Punnagai Mannan Falls, where the movie's suicide scene was shot. Except me and driver, everyone climbed to the top of the falls to take a dip in water before it falls and we parked our vehicle somewhere to view the falls. 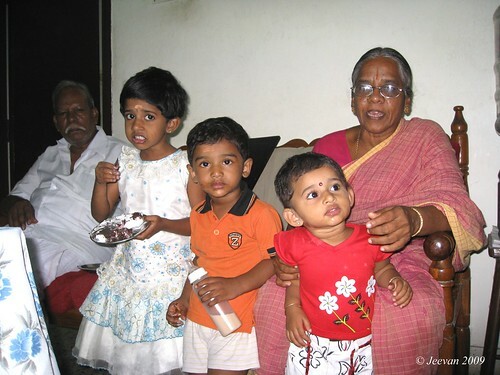 After they return, we had our lunch in a hotel there and it’s the Kerala cuisine that savor’s different. On our way back we stopped at few places to take snaps including a waterfall beside the road and I know it could be something wonderful when it flows fully. It had darkened even before we left the dense forest. The sky opened and closed with either sides of trees and shrubs with crying of monkeys and birds. About 7 in evening we stopped nearby Valpari to have our coffee/tea, and got to hear some scary stories from the village guys about Cheetahs attack and there surprise at seeing our pet, told, the villagers wishfully had many dogs alike ours to only get distress by losing them to cheetah. They also advised us to keep our pet safe, where cheetah could come for its smell. Valparai with milk shortage often, people here got to taste Cuttan Chaya (a tea made with hot water or black tea). I think and felt how wonderful the nature was about to be boundless ones and still, where rivers had there freedom to run and flow wherever it needs, to fill our thirst. But our stupid minds blocked with sketches and fight each day for the natural resource. 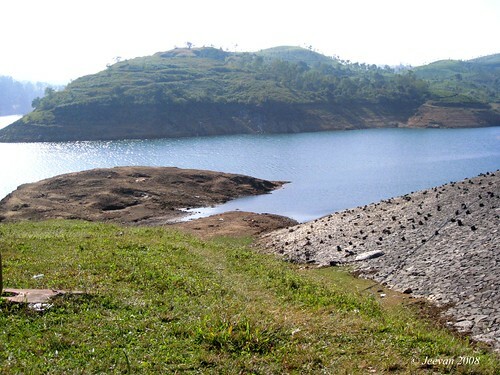 The Sholayar dams remained to be an important part in storing water and connecting interior states of Tamil Nadu and Kerala in support of water shortage or flood. The dam water that flows into KL is driven back again into the TN through the Parambikulam-Aliyar Project, after filling there needs. Something I wonder about Valparai is ‘it has the excess number of dams of 6 within a small region of hills’ that are nearly connect with each other. I think these links could be an ideal in connecting dams and rivers across nation. The purpose of everything was to save the water, the integral part of our lives and future, and the though that rose at that period of time should be praised actually. Madras High Court witnessed a worst violent clash between lawyers and police within campus today. This is something ashamed to see the lawyers who are to protect people with law, jumped into violence to make uncertain the law; If not these fellows whom will follow it certainly… its not a couple of days back that a lawyer and a political party president was attacked and thrown eggs inside the court room by fellow advocates in front of the judge. What these people told by often ‘honorable judges’ is just gone lie by these activities. The stare is even judges injured in this clash. What they destroy is not there own property; and such things won’t make people scare to enter court premises to solve there problems? The flame and clash shook! We have seen some protest in past, but not something like this went to practice. Awaking early 4 in the morning is something tough when it comes to winter season especially. But when it was for traveling means something cool and charm if it was on the ECR (along seashore) to me. The purpose to get up such early or midnight (for me, who wakeup often by 8 or 9am) is nothing to wonder, because it was an event of my sister’s newly build home in Mamallapuram, we’re to attend. The sky remained dark and moist in surface caused me to raise windows, and roads less with people and vehicles, made easier the travel. It was about 6am we reached sis home and the customs where over enough, with least relative to receive. 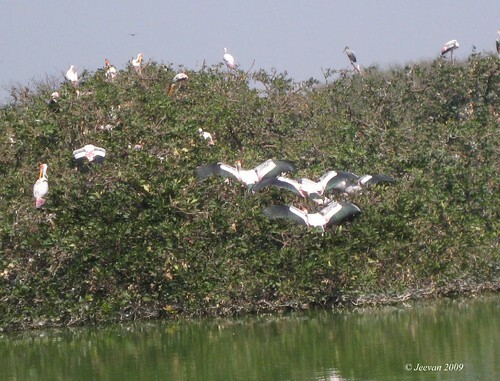 After spending triple of hours there, having our coffee and breakfast, we told and began our travel as per our plan to visit Vedanthangal bird sanctuary about 80km from Chennai. We wasted sometime in mamallpuram searching for a binocular, after buying something like used by children for nothing, we came across Thirukalkundam and Chengalpet, after buying something for our lunch and reached Vedanthangal around none, which is 12km interior right before Mathuranthagam on the GST road. I wised to be there in morning to see more birds, where later they will fly away in search of grains and return only by evening. 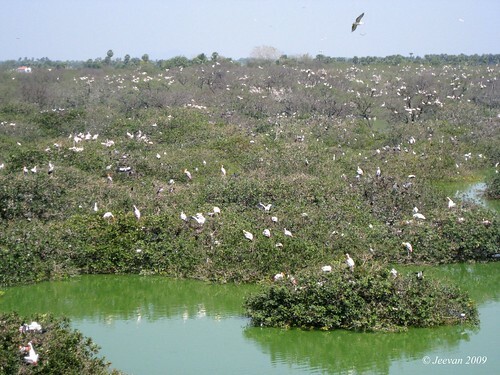 Even though we had to see more birds this time ever before and got to know, those are half the birds and by evening one could see only birds except trees! 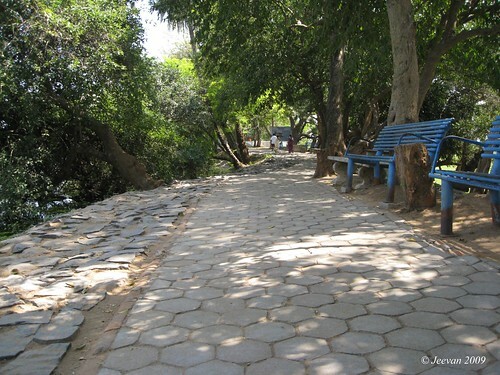 Gladly the tourism dept had build a ramp to climb easily on the lake bank and the pathway are also good to move around. The time we reached, there were preschool children visiting the park and having lunch on the pathway, so we waited sometime for them to finish and we’re no were to disturb them right! 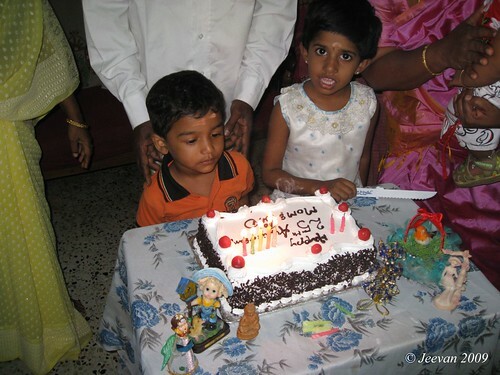 The kids were so sweet and nice, and adorn to have them around. 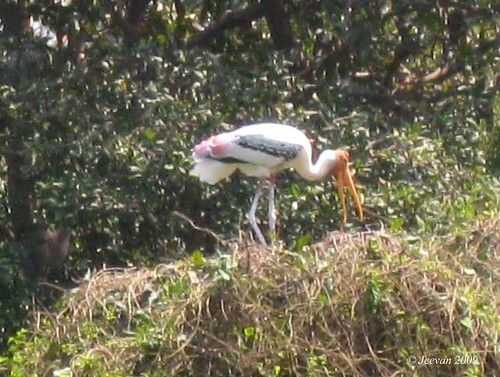 There were so many birds migrated from around the world, and most of all was the painted storks. 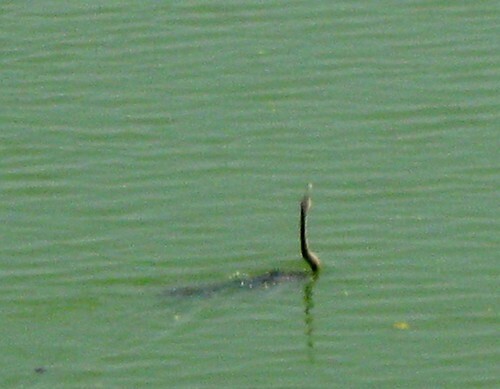 They caught our eyes easily and except those, there were Darters moving on the lake, keeping its head and neck above the water for sometime and get inside the water. The Little Cormorants move far way in water, followed by its chicks. 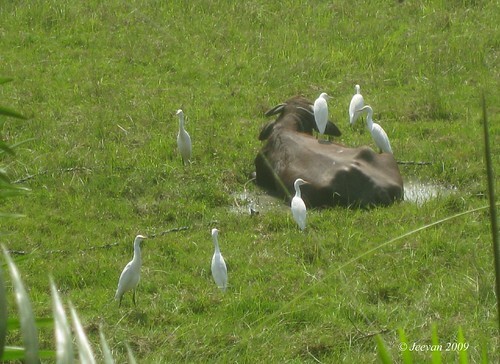 The common Egrets were not seen more, but on the other side of the lake – the farmer fields, I could find some of them around a solo buffalo! There was a telescope tower for a free of cost and my cousin bro and mom climbed on it to get some glimpse on pictures. 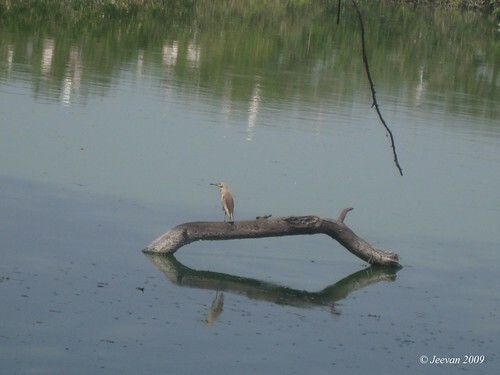 Moving further on the pathway takes to a view point, where one could see a vastness of the lake with birds at distance. After the lunch it was an entertainment moment from monkeys. There were 2 adult monkeys and its 3 cute kids. Soon they saw us having lunch; they came around near slowly and began to stare us. We dropped some food later on the pavement sitter and they began to load as much inside there mouth to look like each have two balls beside there mouth! After taking some pictures and videos of there playful activities, we left the sanctuary around 2pm. On the way dad wished to visit our relative house near Mathuranthagam and there was much time left for evening dark, so we went and spend sometime. It was a village house with separate place for cattle and backyard views of green fields. This is a place I could not forget easily, where I experienced my first and last ice cubes rain somewhere 14 years back! That too was on the same process I think, after visiting Vedanthangal! By 6.30pm we were near home. It was a smooth ride until Tambaram, from where the traffic snail began. First time coming across the newly build flyover at Kathipara Junction – a gate to Chennai, we missed the directing as noted by newspapers already and covered an extra distance to reach home. deep water fishing for long time. flowing from the great Himalayas. It’s a refreshing morning to wakeup early to sense the moister ambiance and to visible the fog masked mountains. The great energy sprinkles in me like those dews on lawn and flowers, even though little stressed physically in lack of bearing cold. As said before cold was not much though at night, but till sunshine warms, I am unable to hold anything properly. This is something I am experiencing every time more on initial days of my visit to hill stations. It was something consent when the numb skin face the sun light in recharging energy. 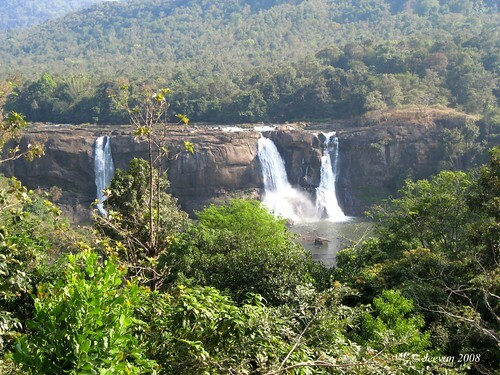 Our first day plan was to check Athirapally Falls in Kerala, which is about 100km from Valparai. Indeed it’s just a destination I loved to travel in-between dense rainforest! It was such an experience ever in my life travel across a massive rainforest into deep, where mystery dumped forever. The woods covered completely leaving little space to vehicles, where we can’t find anything conceals beside those thick and nearly bush. The SUV strikes those bush and tough hardly ride on that road less. The ghat was narrow and carries many ditches to store liters of water! Though there wasn’t rain in early past and current, so the path visible clearly nor would it have been the worst drive through this uncertain trail – a relative who come along said! 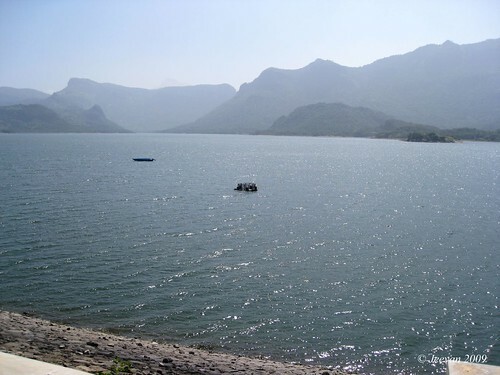 On the way we come across Sholayar Dam 1 – 30km away from Valparai, and two check posts of Tamil Nadu and Kerala. One need to sign and mark the reason to cross the boarder, because it was highly dense forest and haven to endanger animals, woods and shoals. 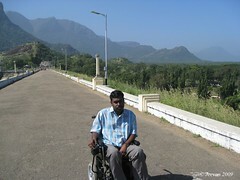 It was just another dream come true for me, next to Valparai. As we’re unaware about the forest, animals and poisonous insects, we weren’t allowed to wander by my parents. Throughout the way we visible elephants dung on middle of the road and broken branches where provide a sign of elephants just crossed. We peeked far long the way; thought we can’t find any animals including a elephant is a great disappointment. We stopped in between to listen to the strange sounds and twitters the forest provides! The lion tailed monkeys leap across those high woods, by creeping branches to strike and dismantle to turn our attention. From a distance we find something moving on the road, when getting near we were at surprise to find a crab stretching its mass! On the middle of the rainforest, we stopped to sight the Sholayar Dam 2, around thick bush and shoals. This is some place I wish to visit again in future to experience some more to memories. This is a route that is highway, links Kerala and Tamil Nadu. On this stretch not many vehicles are visible, and even the Tamil Nadu state govt. leaves bus only twice – one in morning and evening. 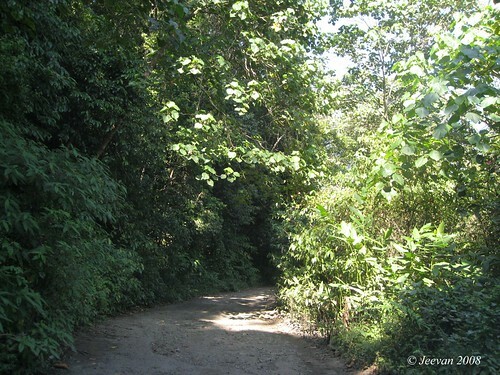 To travel on this rainforest is up to our courage and strength – of drivers! The remaining pictures will be updated soon, here and in Flickr. 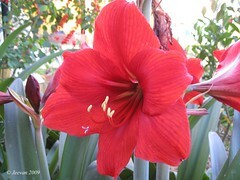 This idea was copied from annie’s red poem, where the inspiration raised from Jan Mader’s Kick your senses into gear... This is not arranged, just by thoughts flow. If you’re interested go ahead to share your sense on Red. The current song from Red, one of my favorite! Been long update on my travel to Valparai, it’s so excite to remember the wonderful journey again by sharing with you all. We moved from Pollachi guest house by 9 and reaching around 10am by Aliyar dam, fare on the widely unloaded road. We sight the hills faraway; surly can’t find the sign of a dam till reaching the curve bridge. 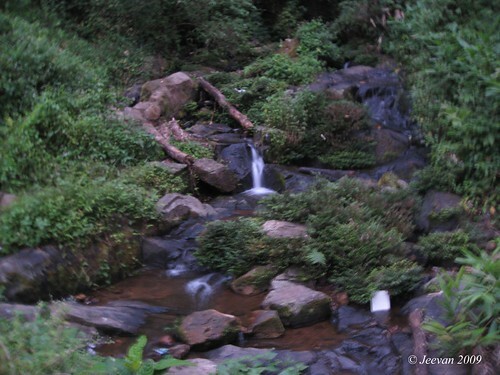 It just located on the foothills of Valparai, so none can miss its existence. Few of our members climbed the many steps, and I am being using wheels, reached the terrace by taking the road end of the dam. I could really see what I seen through pictures via net. It’s a vast bank, goes like a C shape boundary of pathway. As soon reaching top, I could find a house remind me of some Tamil movies taken here. It’s called Chinna Thambi house, where the move was taken, and a famous political scene in Amaithi Padai was shot. 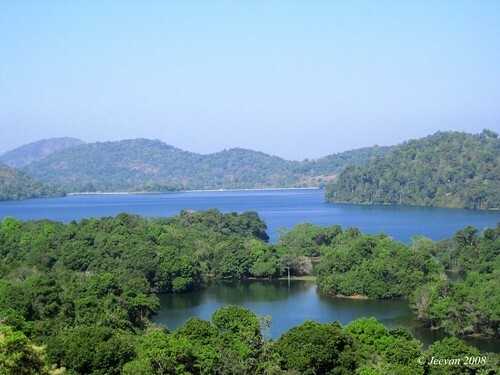 The dam gives a panoramic view of the beautiful Western Ghats and largely extended reservoir, and the other side with green coconut groves until visible. We moved some distance above dam, which could be stretched more than a couple of km to walk. As we proceed, the cool breeze blows on our face, holding the nature and its pleasure. Below the dam there was a small garden with a fountain - not sprinkling currently, an aquarium and a mini theme park. Seems like a boat ride is available in the dam, were we could fine some boats lonely floating in the reservoir To add some information, Aliyar dam is one of the longest in Asia, build in 1962, to store the waters collected throughout the hills of Anamalai range. 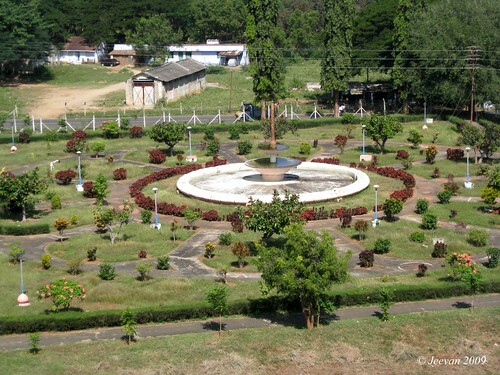 It’s an important water source to Pollachi and its surrounding places, which extends till Erodu district. 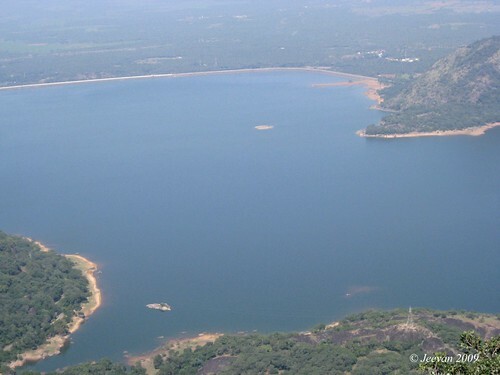 The water flows to this reservoir is from Upper Aliyar and Parambikulam dam in Kerala. Its wonder to know the water system and its connectivity through dams! There are more to go through dams further into this travel, and almost every link would conclude with Aliyar! On the way before climbing ghat, we stopped at monkey falls. As the name refers, there are a lot of monkeys around this site, where our family members went to take shower in the falls. Meanwhile, me and driver bro parked the vehicle and waited, in time to get some nice entertainment from monkeys. As we watch, one monkey enters into a vehicle to steal something, was driven by we and there was a lovely scene of three monkeys sitting on a branch feeding each other. After the falls and a check post later, we encounter the first hairpin bend which continues like zigzag till 13-14 bends. 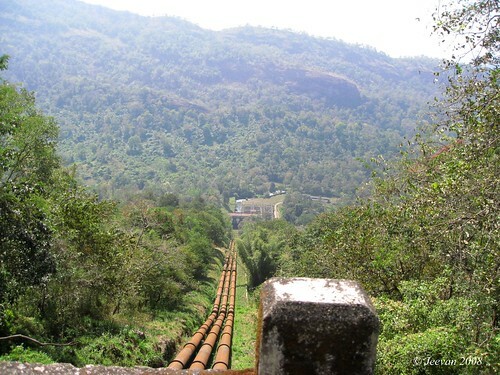 At every bend we sighted different views of aliyar dam and far more, to stop at the 9th bend - lomes view, for more views. And where above the hill there, we sighted some Nilgiri thars, those rarely had seen. On the way, we stopped at AttaKatti to collect our lunch parcels in a small hotel, as we know it may take eventide to reach Valparai! At the end of the waterfall estate, we parked our SUV beside a private estate to have our lunch and I went little further around the place in wheels to view cluster of clouds striking the above tea gardens and hiding the homes. There was a board sign’s ‘mist spread zone’; and I wished to experience the cold within mist, but last only the cold breeze. 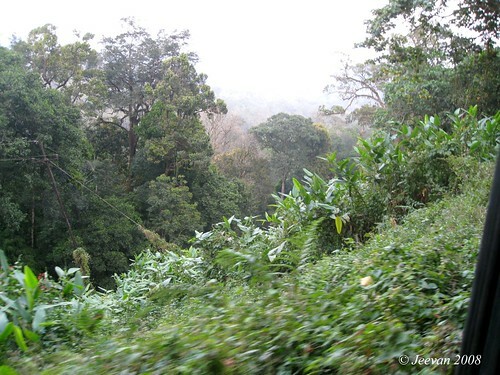 Throughout the way it was scenic, to have clear visions of evergreen tea gardens, and far away hills surrounds with fog! On the last and closing 40th hairpin bend, we saw a sign board that Balaji Temple 7km. So dad decides to visit the temple first, and the sky open to light sunshine moved us ahead. Along the way its quite tea estates; and the temple lies in one of the highest place in valparai, called Karamalal. The road to the Balaji Temple is such rough with many potholes and being very narrow upward, the SUV hardly climbed the hills. Reaching atop we smelled oily from clutch, where later to realize that almost every vehicle odor the same, riding upward. With no idea how well the place gives way to my wheels, so I and sister remain to leave others to visit the temple. My bro, who took the camera to capture some pictures of the temple was warned by the guard, and advised the pictures would not remain. Whether it’s true or not, I lost number of pictures in my cam including those taken at Balaji Temple, when checking the pictures later! Some told they have some magnetic instrument to sweep pictures taken at temple, which I can’t believe how it’s possible without my cam! At the other hand I doubt may someone erased the pictures unaware, even though I could have lost the whole pictures of the day, but I lost only whatever taken after aliyar :( none would do that, as they know how important those pictures are. The drive continues through the tea gardens, to reach valparai by 5.30pm. With the address, we found our relative house, who have booked cottage for us next to there home. To tell, it’s a wonderful stable! We are pleased by the way the home and yarn appears, with more space for parking and gardening. I am so attracted by the views of tea estates and flowers in the garden. The relatives we met there are unknown before, where no memories we meet each others in any occasions, but they most welcomed us, in such a way it pleased receiving there respect and love! Man, it’s an ever evening that we played and been so happy like that, teasing each others. Our uncle cheered the evening and throughout our travel. Till our dinned we spent time in the yawn, playing bat and ball in the pleasing weather. It’s no more like Ooty or Kodaikanal that we head down before the night dawn. This gives a simply fantastic sense! or happiness, in inevitable world! bearing much beyond there strength. been your children in heaven you shown. to give alone lights to future. 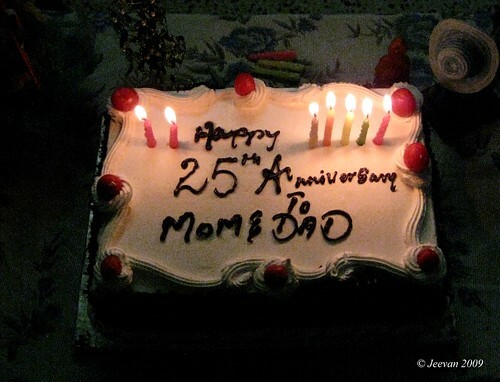 Today marks my parents 25th anniversary, I wish you all bless them for a healthy and happy lifetime. 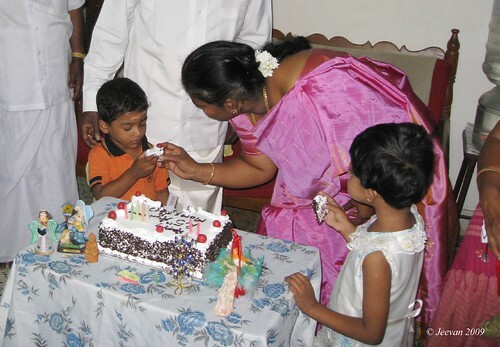 There is a small get together at home this evening to celebrate there anniversary, hope they enjoy the moment! If we tell tamilan, there is a bound. When we tell human, that is immense. Who will kill someone alike us and don’t we sense about the same when one is hurt or killed? In wars we are losing our sense, the nature of being person. What are we taking with us is nothing, and what remain forever is only to practice until mortal. Like how lives are created and what are we destroying is not belong to us, we are only to enjoy. What’s happening in Sri Lanka is well known, the tigers and army are involved in war ever been drastic, causing anxious much to lives and belongings. There is no more distance between TN and SriLanka, but we are unaware about the situation mostly and in bind hands watching the deadly fight, killing most of our innocent civilians, those expecting there rights to be praised. Past is past, nothing can claim justice, more or less taking arms would turn the situation worst, in a narrow path only one vehicle can travel. Either sides never give away, none can pass. This what happening at our neighbor, both sides are armed enough to fight or not, but isn’t right to think about the bare hands? We, calling tamilan, are a part of India and the only people protest against the war in Srilanka. That was the reason or not for the centre to lack its concentration on the issue, to send its representative for talk after so long of varies protests and hundreds of lives lost. I wonder what the distress the 48 hours of ceasefire going to comfort the situation in Srilanka? It’s completely an eye wash, truly can’t believe the hatred of past is forgiven by the congress government to stretch it arms to stop the war against the tigers, within the innocent civilians. 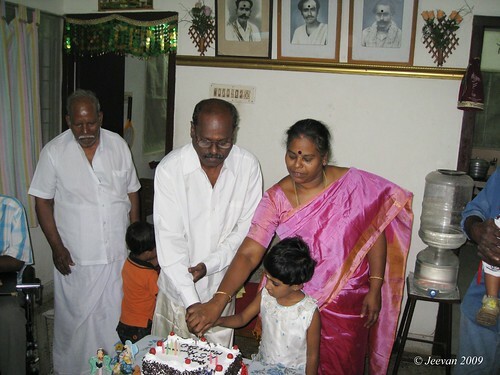 I really felt stupid what the guy MuthukumarMuthukumar did to protest against the war in protecting the Tamilans in srilanka by setting himself on fire. And more its frolic what the political leaders and some actors tribute him as a hero, and his death as a sacrifice to show there support in violence. Does this look fine to those admiring leaders, more than to condemn, praising the act, which is suppose to encourage. Killing hundreds of lives in war, just this one life signifies to those watching and ordering advance in war! How blind some people are, and I am quite against those killing themselves without living the normal life they got. I wish to tell the world please give your wonderful lives to exist, to the fullest, which we disabled to lack and crave living normal. I see the gate open, but no one is interest or sign to think cross the border to give an attempt to solve the crisis. Just keep on urging the centre by protest procession, hunger strikes and conducting shutter close, why not pressure the invited leaders by Sri Lankan president for a peace talk with tigers and if possible with the government. Instead of indirect talk with center govt., there is a welcome note to converse directly with authorities to express our rights and thoughts to convince the situation comfort. May wish or not, agree or disagree, just we request you leaders to go and save our humanity or sent some representatives who represent u, if you pause of security and comfort. As soon as possible we stop the advance of either sides, would save the remaining lives. There could be a political solution for sure, if the minds accept the truth. For instance Nepal is a country, ones with armed Maoist fight against the monarch to give people the republic, where they leave the weapons and later people chose the maoist to rule. Where the dissimilar between Americans, has witnessed dismiss of color discrimination in hope for a global change. None is less to another, we are created similar with wisdom and heart, and what important is how well we express them. Let peace to remain please.